Our vast inventory makes your construction or renovation project a success! 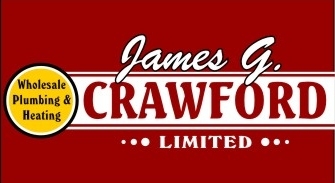 James G. Crawford Limited is the partner you seek for your renovation and construction projects in St. John's and Avalon region. Specialising in heating and plumbing supplies, we are a wholesaling company dedicated to provide our clients with quality fixtures and materials for bathrooms and kitchens. With our kitchen equipment, you can now combine functionality and style. All our products are CSA and Equal compliant, as well as guaranteed by the manufacturers. Are you more Bath or Shower Type? We have best ways to make your bathroom the perfect place for relaxation. Our local, family owned business offers you over a century of experience. In our two-floor showroom, in St. John's, contractors and designers are welcome and there is no need to make an appointment. The first floor displays our vast inventory of plumbing supply while the second floor is a proper showroom where you can get inspired. And don’t worry about stock: if it is on display, then it is available! Durable and efficient plumbing systems take quality pipes and fittings. If you are a homeowner interested in do-it-yourself projects for your bathroom or kitchen, don’t hesitate to come and see us! Our competent staff will be happy to help you choose the right vanity or faucets and will most certainly have a good piece of advice for you! From pumps to furnaces, we bring comfort to your living or working space!